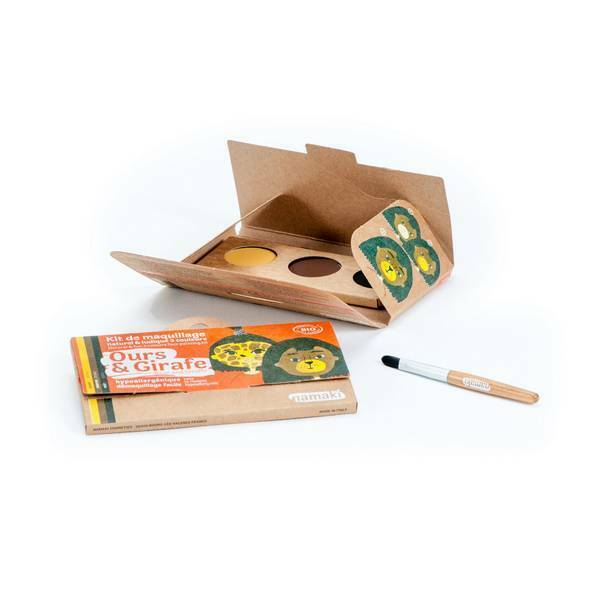 A colourful face paint set, made from organic and hypoallergenic materials. - 1 decorated cardboard pallet. - 3 eyeshadows (3 x 2.5g). - 2 face paint designs. Black, white , orange , green, blue, pink: zea mays starch (zea mays (corn) starch)*, glyceryl oleate citrate, caprylic/capric triglyceride, oleic/linoleic/linolenic polyglycerides, tocopherol, parfum (fragrance), benzyl alcohol, dehydroacetic acid. Red, yellow: mica, zea mays starch (zea mays (corn) starch)*, glyceryl oleate citrate, caprylic/capric triglyceride, oleic/linoleic/linolenic polyglycerides, tocopherol, parfum (fragrance), benzyl alcohol, dehydroacetic acid. All colors may contain +/- : CI 77891 (titanium dioxide), CI 77491 (iron oxides), CI 77492 (iron oxides), CI 77499 (iron oxides), CI 77007 (ultramarines), CI 77288 (chromium oxide green), CI 77742 (manganese violet), CI 75470 (carmine). The French brand Namaki offers face paint sets for children that are certified organic and hypoallergenic. The parents and specialists in organic cosmetics who create Namaki products want to give a new life to face paints by offering products that are safe and reassuring for parents, as well as being fun and easy to use for children. Made exclusively from natural products, clinically tested, hypoallergenic and certified organic, Namaki face paints are designed so that children and adults can enjoy themselves safely. Namaki’s packaging is also developed with the aim of reducing the impact on the environment. It is made from water-resistant kraft paper, does not contain plastic, and is 100% recyclable. Namaki’s aim is clear: allowing children to have as much fun as possible, while at the same time looking after their health and the environment.